QE debaters have reached the European Youth Parliament national finals after putting in an excellent performance at the South East regional round. 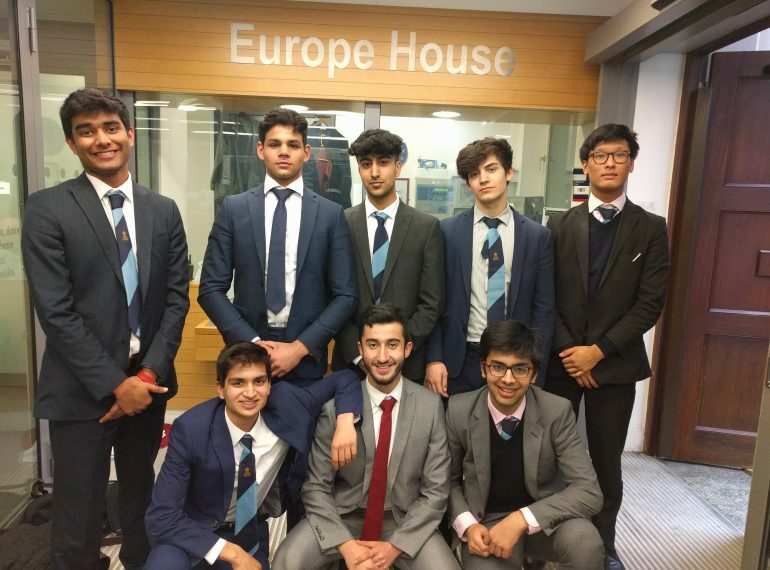 Eight Year 12 boys headed to the European Commission’s London building in Smith Square for the EYP South East forum, where they and teams from two independent schools – St Paul’s and Guildford High – were chosen to go through to the national event later in the year. The QE sixth-formers defended a Committee on Security and Defence (SEDE) resolution which proposed steps towards greater integration and co-operation between the armed forces of European Union countries. The 40-minute debate began with an opening speech from Akshat Sharma in which he stressed that, in view of the aggression it faces from countries including Russia and North Korea, the EU needs both to increase its spending on defence and to improve the level of co-operation between EU countries, so that the increased funding is spent effectively. His stance was duly opposed by a speaker from Haberdashers’ Aske’s Girls’ School, to which Mipham Samten then responded. After further debate, Mipham gave a summation of the QE team’s arguments: “Mipham put a great deal of work into the team’s preparation and gave a leading contribution,” Miss Davies said. The subsequent vote on the resolution was 63 against, and 14 for; Miss Davies pointed out that, in fact, no resolutions were passed throughout the whole day. After the debates, the jury provided general feedback to all the teams, praising them for their enthusiastic participation and their research. As well as Akshat and Mipham, the team comprised: Ibrahim Al-Hariri; Parth Gosalia; Shivam Masrani; Laurie Mathias; Anake Singh and Mudit Tulsianey.